Two secret ingredients make these all butter sugar cookies a family favorite and the first cookie to go at a party! 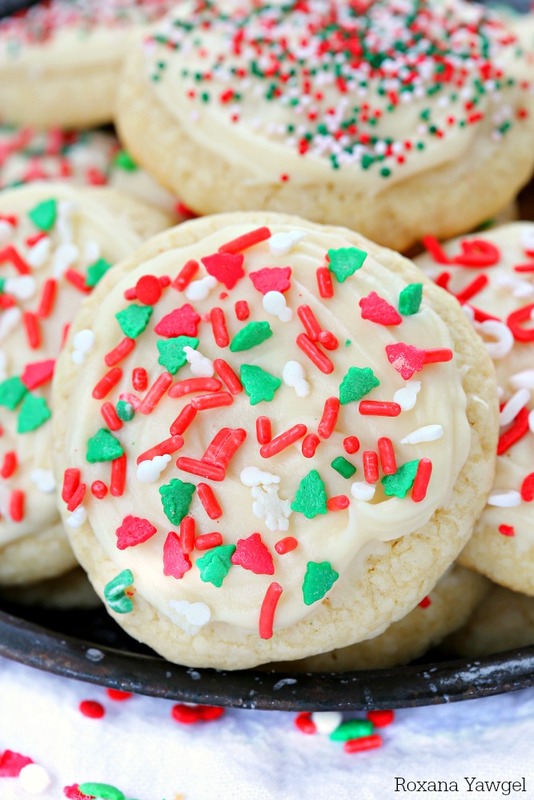 No matter the season or the occasion, this is my go-to recipe for sugar cookies! Soft sugar cookies are hands down my husband’s favorite cookie! Every now and then he comes home with a package of store-bought soft sugar cookies topped with vanilla frosting and seasonal sprinkles. You know the ones I’m talking about, right? Creating a recipe to top those cookies has been on my list for quite some time, and although I almost had it, I was not 110% behind it. Mostly because it called for a little bit of shortening to prevent the cookies from spreading too much and I wanted all butter sugar cookies. 5 pounds of butter, a dozen of eggs and lots of sugar later, I finally have the butter sugar cookies of my dreams!!! The secret to my sugar cookies? Well, there are two secret ingredients! The first one is Finlandia Butter! 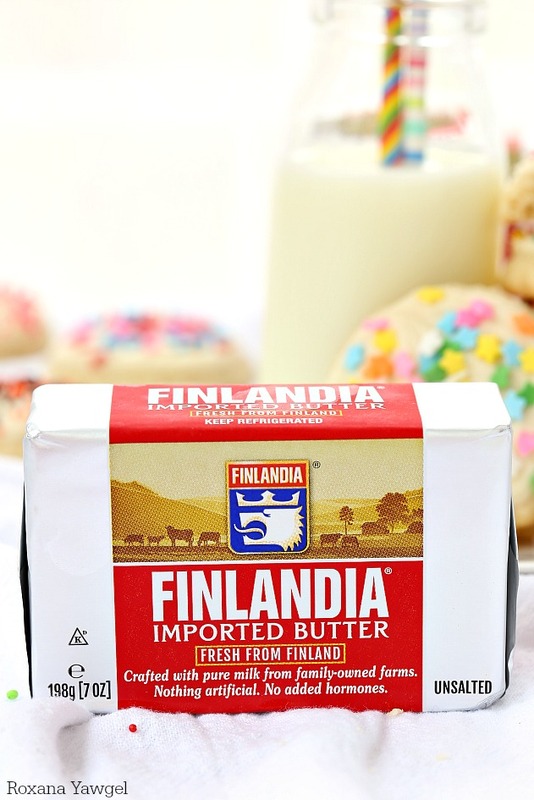 Finlandia butter is a European-style butter preferred by most French pastry chefs for baking. Delicious and creamy with a very rich taste, Finlandia butter is made from pure fresh milk from Finnish family-owned farms. 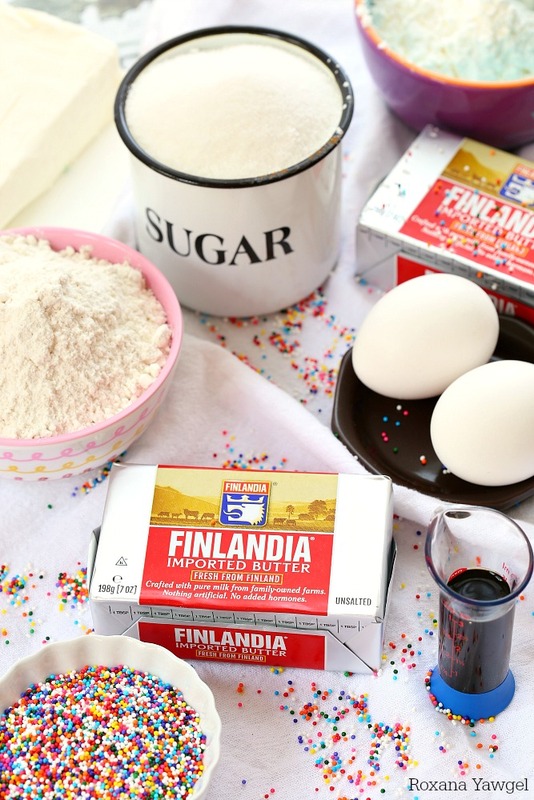 Since it has a high fat content, Finlandia butter is perfect for baking, especially when you want the butter flavor to shine through like in these sugar cookies! The consistency of the butter is just as important at the high fat content. Butter must be softened, but not melty. You should be able to press your finger into the block of butter and make an indent easily. For best results, leave the butter out for about 30 minutes to soften and provide more flavor. Before I move to the next ingredient, please note a package of Finlandia butter has 7oz and you’ll need 8oz. 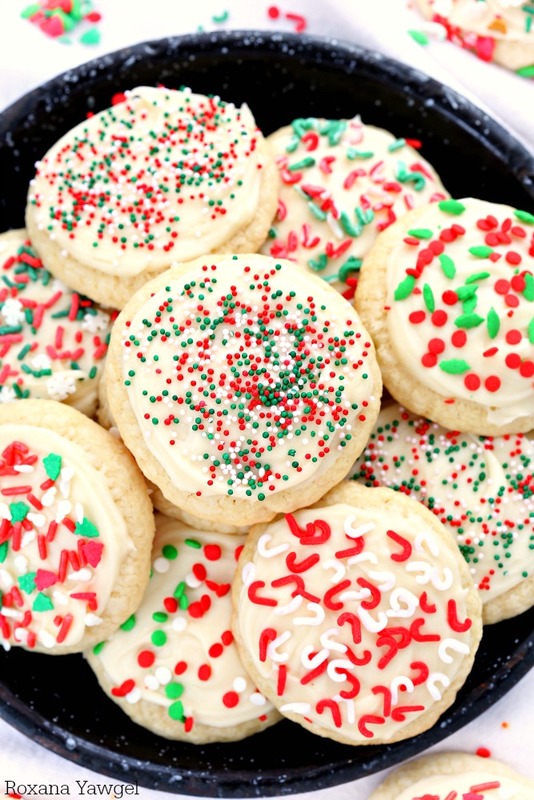 for these butter sugar cookies! In addition to the butter, you’ll also need the classic ingredients to a sugar cookie – eggs, sugar, vanilla extract, all-purpose flour, baking powder, and cornstarch! Yes, cornstarch! Cornstarch is the second secret ingredient! I know it’s not your typical cookie ingredient but just like Finlandia butter, it has magical powers. Cornstarch helps thicken the dough while chilling it and keeps the cookies soft while baking. No wonder they simply melt in your mouth even the next day! Once you made your cookie dough is very important to chill the dough, for at least 1 hour! Depending on how much time I have on my hand, I either scoop the cookie dough using a medium size scoop on a baking sheet and refrigerate it for 1 hour, or shape the entire cookie dough into a 2 inch long and chill it overnight. If chilling scooped cookie dough, just before baking I gently flatten the cookie balls for an even baking. If you chill the dough overnight, like I try to do most of the time, when you’re ready to bake, slice the cookies about 1/3 inch thickness and bake in the heated oven. Before I leave you with the recipe, it’s very important to remember not to over-bake the cookies. Once the cookies are baked, I leave them on the baking sheets for 1-2 minutes before transferring on a wire rack to cool completely. 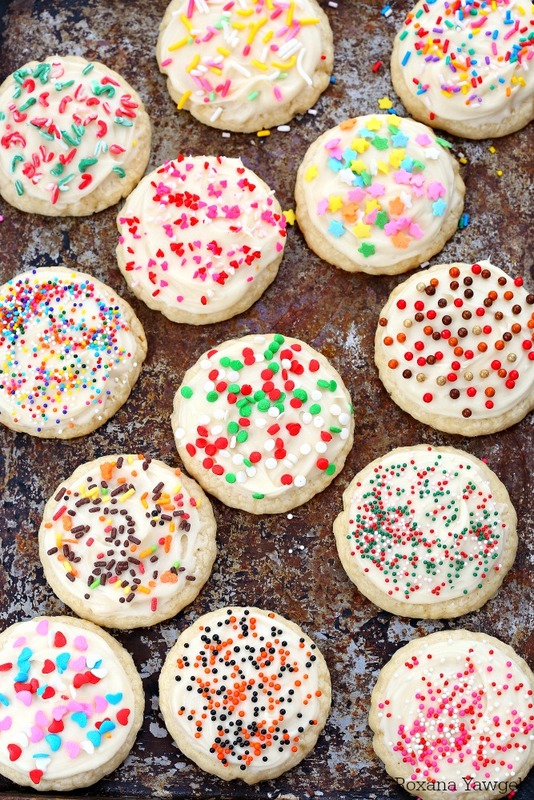 At this point, you can start munching on your freshly baked sugar cookies or decorate them with a cream cheese frosting and of course, colorful or seasonal sprinkles. If you enjoyed this recipe, vote for it on Finlandia Cheese Facebook page for your chance to win $1,000 towards your dream trip!! Here’s the mobile version and the desktop version of the contest!! In a mixing bowl add the butter and sugar. With the paddle attachment on, beat on low speed until light and creamy, about 3 minutes. Stir in the vanilla extract and the two eggs, one at a time, mixing well after each addition. 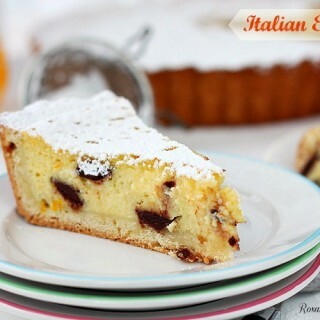 In a separate bowl, whisk together the flour, cornstarch and baking powder. Gently fold the flour mixture into the butter mixture. Beat until just combined. Slice the cookie dough into 1/4 - 1/3 inch thickness and place on two baking sheets. Heat the oven to 350F. Bake the cookie for 10-13 minutes until the edges are barely golden brown and the center is set. Remove the baking sheets from the oven, let the cookies cool for 1-2 minutes before transferring to a wire rack to cool completely. In a mixing bowl, add the cream cheese and butter. With the paddle attachment on, beat on low sped until light and fluffy, about 5 minutes. Stir in the vanilla extract and gently beat in the powdered sugar. Once all the sugar is added, increase the mixer’s speed to medium-high and beat for 2 more minutes. 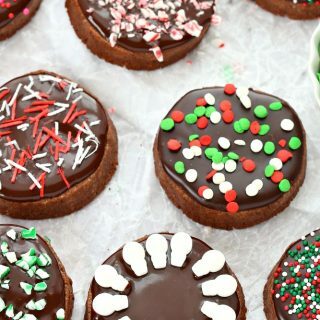 With a small spatula, spread a little frosting over each cookie. I have added this to my to do list for Thanksgiving and Christmas. 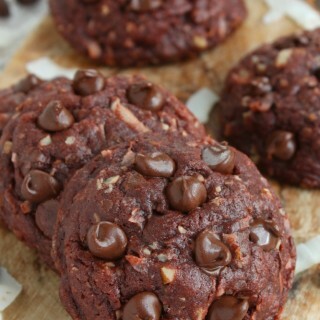 I might have to make a trial batch this week just to make sure they are what we want....LOL Can't wait to make these. 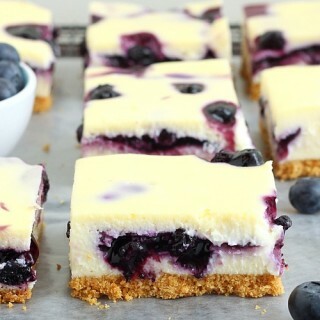 These look so good. Great for Christmas but I am not going to wait that long to make some. Yum! These sugar cookies look so good. I found your recipe on The Recipe Critic's awesome eats pinterest page. 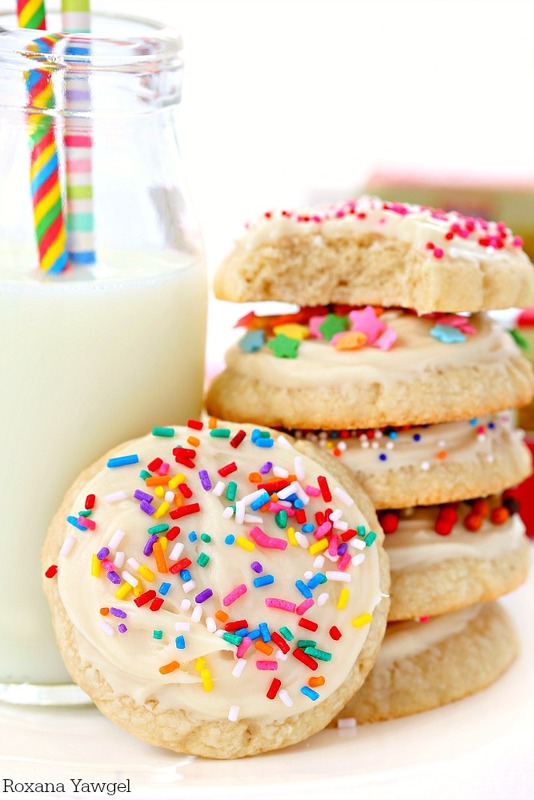 I'm always looking for the best sugar cookie recipe, so I will give this one a try. Can any unsalted butter be ok.. Im not sure i can find the brand you used.. Also could you use cookie cutouts for these cookies?